Restland Memorial Park Association was founded in 1932 by the Dowd and Kanengieser Families, who managed the park for a decade; and the Kanengieser family managed the property until 1997, when the management was assumed by CMS Mid-Atlantic, Inc. 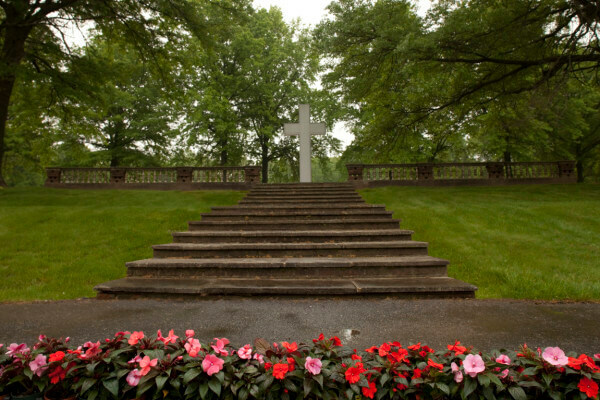 The wooded grounds provide a breathtaking and peaceful place for reflection and prayer. In addition to the natural beauty of its grounds, Restland has the magnificent St. Giles Chapel as its crowning jewel, built in 1937 as an authentic replica of its namesake 12th century church in Stokes Poges, England. The poem, “Elegy Written in a Country Churchyard” was completed by the poet Thomas Gray in 1750, in the churchyard next to the original St. Giles Parish Church in Stokes Poges, England. The Restland Chapel features hand-carved pews and altar furnishings, weathered stone walls, wrought-iron fixtures and brilliant stained glass windows. The stained glass windows were the study and craftsmanship of artist G. Owen Bonawit, one of the nation’s foremost authorities in stained and leaded glass in the 1930s. In addition to being used for memorial and interment services, Restland’s St. Giles Chapel is used for weddings, concerts and special religious services. Through the years, Restland Memorial Park has expanded its grounds to include six mausoleums along with several columbaria. There is also a specially designated veterans area within the underground public mausoleum section. Other special features of this nonsectarian memorial park include the Pipes of Pan Garden, a rippling brook, an English Garden, the Garden of the Cross, the Path of Meditation, a goldfish pond and a sundial.